Shoe preferences across the United States are incredibly varied. For example, you might not see an NYC girl wearing the same shoes out to dinner as a girl in, say, Honolulu. Climate and the culture of a place can play a sizable role in women's shoe choices, as does the aesthetic of a particular city or state. But there's one shoe style, in particular, that it seems everyone in the country can agree on: sneakers. We rely on them for comfort, exercise, and, these days more than ever, fashion. 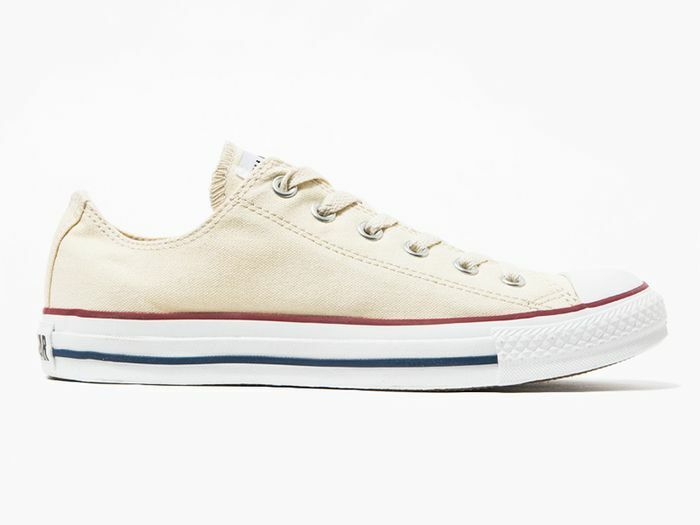 Not only does pretty much everyone wear sneakers, Refinery 29 recently reported that a Polyvore study found that the most searched-for specific sneaker in all 50 states is Converse, according to data pulled for January through April of this year. (Another favorite of ours, Vans, was #2 in 48 states.) As Amy Wicks, senior fashion editor at Polyvore told Refinery29, "I can't remember the last time one brand dominated the country this way." She also pointed out that since most Polyvore searchers already own a pair of Converses, many of the searches are geared toward cute outfits to wear with Converse sneakers. While it's surprising that the country is in such agreement, it's not surprising that Converse is the most-searched sneaker. We'd be hard-pressed to find a fashion girl who hasn't owned a pair of the ultra-popular (and affordable, ringing in at $55 on average) classic Converse Chuck Taylor sneakers at some point in her life. Read on to shop a few of our favorite Converse Chuck Taylor sneakers, starting at $55. We love this particular shade paired with dresses. Doesn't get more classic than this. This pink hue is subdued enough to work as a neutral. Found: Your new white summer sneakers. Denim shoes and embroidery are having a moment. Bingo. Next up, find out which sneaker trends are on the horizon for the remainder of 2017.